Knight Adventures is a side scroll jump`n`run platform game. The objectives of the game is to destroy all monsters and collect all jewels. Help Knight to free four worlds from monsters! 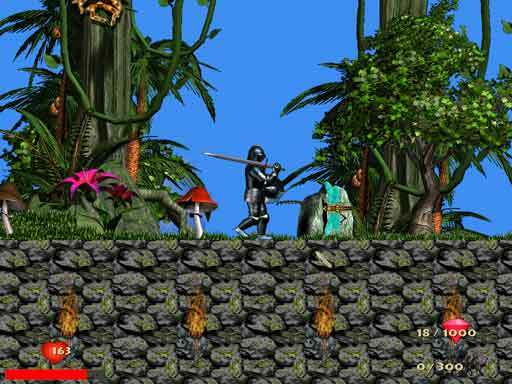 Knight Adventures - game for all ages. Full version has next benefits: * Four huge amazing worlds. Maze of streets - town. Secrets a wood - wood. Near priory - village and priopy. Shadow of old castle - jungle and castle. * Excellent hi-color graphics. * 11 types of monsters. Bat Small spider Big spider Rat Snake Wolf Stump Goblin Dragonfly Skeleton Dragon * 6 layers of animation with parallax effect. Far background layer. Layer of clouds. Middle background layer. Base layer. Layer of sprites. Upper layer. Controls: Left arrow - move left. Right arrow - move right. Up arrow - jump. Ctrl - sword. Bonuses: Jewels all types, coins, bag with coins. Bottle with "water of life" (restore 10 points of life). Piece of meat (restore 20 points of life).